We are a transport company providing services on the UK domestic market as well as the international market. 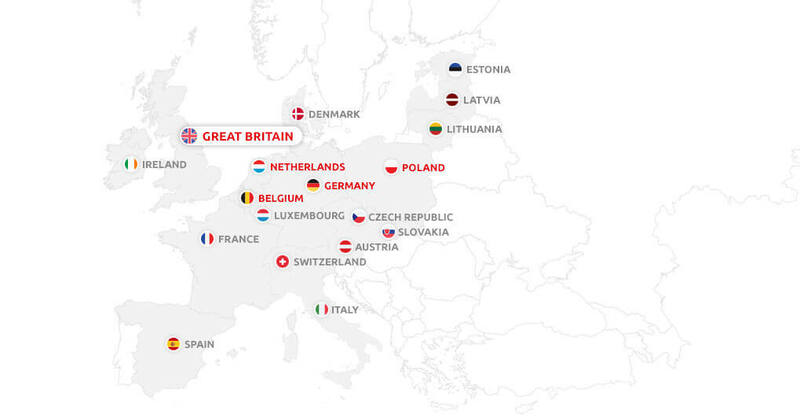 The main directions in international transport are to Germany, Poland, Belgium and the Netherlands. DAW-TRANS LTD is a part of DAW-TRANS (capital company, limited liability company) which has been present on the British market for 11 years. The regular group of clients who have been using our services for years is confirmation of the reliability of DAW-TRANS as a partner for transport and business. 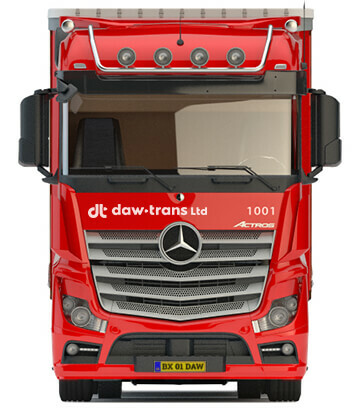 DAW-TRANS LTD is a result of the continuing development of DAW-TRANS, and is intended to make us more familiar with the British market, raise the profile of the company and to produce further opportunities for development. By using the standards developed by DAW-TRANS, together with our experience, we ultimately want to build an independent service with its own transport facilities, offering new jobs and work based on the principles of healthy competition. None of our vehicles are over 3 years old, and we use Mercedes-Benz and Volvo tractor units, with 13.6m Krone curtainsider semi-trailers with a payload of up to 24.5 tonnes. All vehicles are adapted for transporting dangerous goods under ADR. We have access to 70 vehicles a week in the UK, while the whole fleet numbers some 130 units. DAW-TRANS LTD works in compliance of RHA conditions of carriage, copy of which are available on request or can be found on our website http://www.daw-trans.co.uk/RHA-terms&conditions. When deciding to undertake transport booking from DAW-TRANS Ltd, you must be sure that you are able to fulfil it. That means you should have a proper equipment, it must be available as required in the transport booking, driver(s) has/have enough working/driving time, vehicle and goods in transit should be sufficiently insured. By proper equipment we understand, not damaged tarpaulin, full set of side boards ( 20 – 30), anti slip mats ( enough to cover loading space on trailer floor), stop bars ( equipment to secure goods form the back), truck and trailer should be in a good condition with all needed and valid paperwork required on public roads. You should be aware of driver’s working/driving time and be able to give us update on his location any time we will require within working hours, out of them as it will be agreed. We must be notified about any of delays/breakdowns immediately. Loaded vehicle must be parked at secured/fenced parking areas, while carrying goods on behalf of DAW-TRANS Ltd.
Goods must be effectively secured during transit. Any damages to the goods, packaging that happened during transit should be reported immediately to DAW-TRANS Ltd. DAW-TRANS Ltd reserves right to commence proceedings against you for damage compensation claims. The insurance of carried goods should be no lesser that £ 250,000. You are always deemed as a first carrier ( Article 36 CMR). Sub-contracting, co-loading, reloading, transhipping undertaken goods is forbidden unless you have received written agreement for this from our company. When Hazardous Goods in terms of ADR are carried, your company ( office, driver, vehicle ) must comply with ADR regulations. You should be able to contact your DGSA, driver should have ADR licence, vehicle should be equipped according to ADR requirements. DAW-TRANS Ltd reserves right to change transport booking ( loading, unloading addresses, dates) any time after the carrier accepted the transport booking. Extra charges to cover extra work resulted from the changes will be agreed with your company. You should ensure that collection and delivery of the good will be confirmed by your company by signed CMR note. Invoices must be accompanied with CMR note signed by loading, unloading points and the carrier, if any other documents like Lieferschein, Delivery Note, pallets exchange note were given to the driver or were listed in CMR, they should be attached to invoice with CMR. By accepting the transport boking you accept policy of DAW-TRANS Ltd customers protection. You will not contact customers of DAW-TRANS Ltd directly aiming to provide transport service for them for period of 2 years from day the transport was finished. Any problems at loading/unloading points that might result in an argument with staff working there should not be dealt by drivers directly or by your office but by contacting DAW-TRANS Ltd office immediately. You should be aware of and comply with all road taxes, tolls, HGV driving restrictions that my occur on route while carrying goods on behalf of DAW-TRANS Ltd, failure to that may result in fines, penalties or even stop of vehicle by relevant authorities, what in turn may result in delay of deliveries. You should be aware of and comply with provisions of German Minimum Wage Law (MiLog), this applies also subcontractors that you will employ. You agree to indemnify DAW-TRANS Ltd from any fine, financial penalties that may occur for not respecting this Law by your company or your subcontractors. © 2019 DawTrans Ltd. All rights reserved!